This show probably doesn’t need my help, but the lineup looks pretty cool and it literally “flew” right under my radar until a couple of days ago. Friends with a Benefit is actually a benefit for the American Bird Conservancy (aren’t we all ornithologists at heart) and its happening at NYC’s historic Town Hall on August 29, 2010. 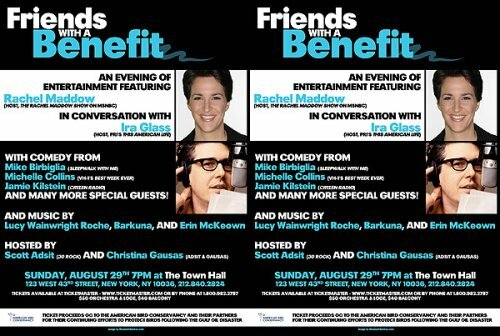 The advance publicity promises an evening of live entertainment featuring MSNBC’s Rachel Maddow in conversation with PRI’s Ira Glass. The show is being hosted by 30 Rock‘s Scott Adsit and Christina Gausas and also features comedians Mike Birbiglia, Michelle Collins and Jamie Kilstein and musicians Lucy Wainwright Roche, Barkuna and Erin McKeown. Read a little more about Friends with a Benefit after the jump. Please join us for Friends with a Benefit, an evening of live entertainment with proceeds going to American Bird Conservancy. Rachel Maddow (host, MSNBC’s The Rachel Maddow Show) will join Ira Glass (host, PRI’s This American Life) for a live, onstage conversation at New York City’s famed Town Hall. Noted comedians, including Mike Birbiglia (Sleepwalk with Me), Michelle Collins (VH-1’s Best Week Ever), and Jamie Kilstein (Citizen Radio), will join acclaimed musicians Lucy Wainwright Roche, Barkuna, and Erin McKeown for an exciting line-up of comedy, music, and entertainment, hosted by Scott Adsit (30 Rock) and Christina Gausas (Adsit & Gausas). And more! Friends with a Benefit is an evening of entertainment with ticket proceeds going to for our efforts to protect native birds and their habitats in the wake of the Gulf Coast oil disaster. Town Hall is located at 123 West 43rd Street, New York, NY, 10036. Tickets: $50 for Orchestra & Loge, $40 for Balcony, and are available through Ticket Master online at www.ticketmaster.com or by telephone at 1-800-982-2787.